Shade : Sunkissed Angel - A medium shade of bronzer for all skin types. 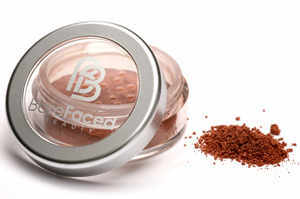 Barefaced Beauty 100% Natural Mineral Bronzer gives a gorgeous healthy sunkissed glow, just dust on your cheeks, face, or shoulders. Vegan friendly. Gently brush the bronzer onto your cheeks and anywhere else you want to add warm tones. The only mistake you can make is to use too much. For darker colour, apply a second layer. Shimmer Ingredients: Mica (CI 77019), +- [Tin Oxide, Manganese Violet (CI 77742), Ultramarine Blue (CI77007). Bronzer Ingredients: Mica (CI 77019), [+/- Titanium Dioxide (CI 77891), Iron Oxides (CI 77491, CI 77492, CI 77499.